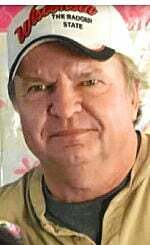 Beloit, WI -- John W. Brewer, 60, of Beloit, WI, died Thursday, April 11, 2019 in Beloit Memorial Hospital. He was born March 28, 1959 in Beloit, WI, the son of Dewey H. and Lorraine M. (Kirst) Brewer Jr. John was a 1977 graduate of Beloit Memorial High School. He married Karleen L. Bolly on September 3, 1983, in Sun Valley Presbyterian Church. John was employed by Yoss Construction. He was a hard worker, who loved hunting, fishing, making his yard flawless and helping others in a time of need. John enjoyed giving everyone nicknames and telling jokes. He had a contagious smile and heart of gold. John was a loving son, husband, father, grandfather, uncle and friend who will be missed by all. Survivors include his wife, Karleen Brewer of Beloit, WI; children: Joe (Elizabeth) Brewer of Beloit, Ryan (Lindsey) Brewer of Janesville, WI, and Amy (Dyrell Dixon) Brewer of Beloit; grandchildren: Jalen, Brooklynn, Draymon and Haylee; his mother, Lorraine Brewer of Beloit; nieces: Gina Brewer of Beloit, Sami Gonfiantini of Janesville, and Hannah Bolly of Beloit; nephews, Jeremy (Casey) Brewer of Baton Rouge, LA, and AJ Gonfiantini of Janesville; aunt, Nancy Steinmetz of Beloit; mother-in-law, Joyce Bolly of Beloit; brother-in-law, Ron (Debbie) Bolly of Beloit; and sister-in-law, Jenny (Mike) Gonfiantini of Janesville. He was predeceased by his grandparents, Florence and Wallace Kirst; father, Dewey Brewer, Jr.; brother, Raymond "Maynard" Brewer; father-in-law, Denny Bolly; grandson, Grayson John Brewer; and uncle, Stan Steinmetz. Funeral service for John will be at 11 a.m. Wednesday, April 17, 2019 in the Daley Murphy Wisch & Associates Funeral Home and Crematorium, 2355 Cranston Road, Beloit, WI, with Pastor David Ewing officiating. Burial will be in Newark Cemetery. Visitation of remembrance will be from 5 p.m. to 8 p.m. Tuesday in the funeral home. Visitation will also be from 10 a.m. until the time of service Wednesday in the funeral home.